Together with their Chinese colleagues, Senckenberg scientists studied the feeding habits of the Asian elephant and its extinct relative, the stegodon, during the Pleistocene. They reached the conclusion that the Asian elephant had a more diverse diet, which gave it a distinct advantage. The study was recently published in the scientific journal Quaternary Science Reviews. Stegodon orientalis is an extinct proboscidean species, and despite its relatively long and low-slung body, a close relative of the modern Asian elephant (Elephas maximus). 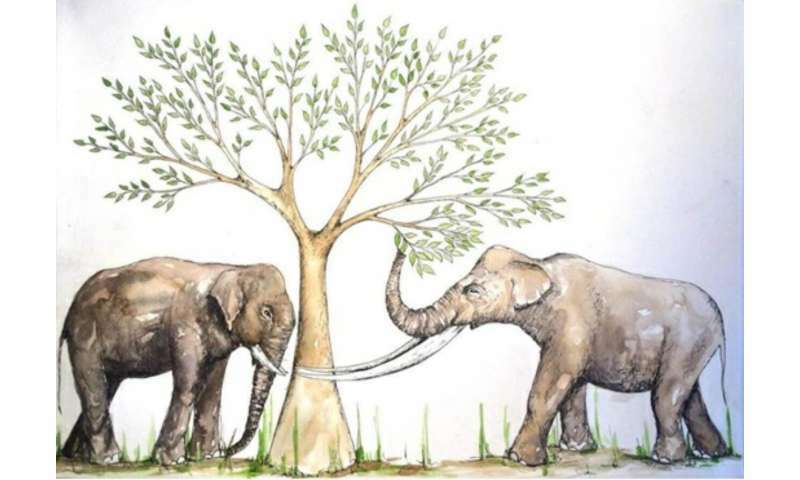 "During the Pleistocene epoch, approximately 700,000 years ago, stegodon and elephant herds occurred in surprising coexistence in Southeast Asia," explains Prof. Dr. Hervé Bocherens of the Senckenberg Centre for Human Evolution and Palaeoenvironment. "But only the Asian elephant has survived into modern times – and we have now investigated the reasons behind this." Together with a team of Chinese researchers, the scientist from Tübingen examined 100,000 to 60,000-year-old tooth fossils of the two proboscidean species from the Quzai Cave in southern China. "Using carbon and oxygen isotopy in the animals' tooth enamel, we were able to show that the Asian elephant had a more flexible diet than stegodon," explains Jiao Ma, the study's lead author from the Chinese Academy of Sciences. So-called C4 plants, such as herbaceous shrubs in the savannas, leave behind a different signature in the tissue of herbivores than do woody or C3 plants from forested areas. These signals, preserved over millions of years, indicate that stegodon preferred to forage in dense forests, while the Asian elephant searched for food in both the savannas and in wooded areas. "These different foraging habits could serve as an explanation for the parallel existence of both proboscidean species during the Pleistocene and also be one of the reasons why stegodon became extinct. During their joined occurrence, the animals occupied separate niches, keeping the competitive pressure relatively low. However, due to its flexible feeding habits, the Asian elephant was better able to adapt to changing environmental conditions – which likely proved to be the deciding factor in its survival," adds Bocherens in conclusion.